Water operators in Nevada who need to complete the necessary amount of continuing education units (CEUs) have found what they are looking for. Our courses are designed to provide the training that will meet the state requirements for renewal of a water operator license and an education that is informative and practical. 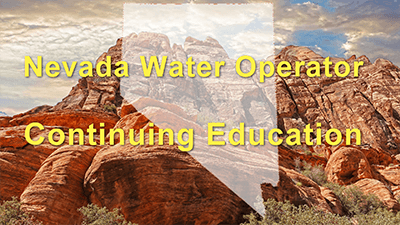 What are the continuing education requirements for Nevada water operators? The AYPO tech (At Your Pace on Line) on line courses submitted are approved for Nevada Drinking Water Operator Certification Program at a total of contact hours as indicated next to the course listing as indicated in your website. Please ensure that your attendees wishing to submit Nevada contact hours for certification renewal receive a signed certificate from your program with the attendee's name, the name of the class, the date and the number of hours approved. I have requested to have our website updated to include AYPO tech (At Your Pace on Line) on our External Educational Sources List.